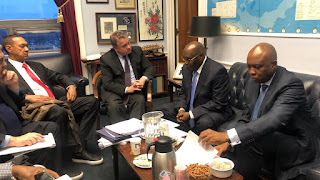 Federal Government of Nigeria, the All Progressive Congress said that a member of its opposing party, "Atiku Abubakar" of "PDP" has queries to answer when he returns from his recent trip to the United States of America. The Government said that Mr "Atiku Abubakar" is still undergoing "investigations" as per his alleged role in the collapse of former Bank PHB. This was made known by the "Minister of Information and Culture" Mr. Lai Mohammed while briefing State House correspondents on Friday. “It started from an internal memo dated 13 January 2009 asking that a draft in favour of Atiku Abubakar of 156 million should be raised,” he said. He said the Government has proofs and evidence of the account mandate, cheque and account statement showing Mr Atiku Abubakar as the signatory to the account that received the money. “We want him to stay in the US for as long as he wants but he has to explain to Nigerians when he returns,” he said. The minister reminds that the government had earlier issued a statement advising the U.S. not to issue him a Visa. “We are not perturbed one bit. He can go ahead and get a U.S. green card. That will not save him from imminent defeat in the forthcoming election,” Mr Lai Mohammed he said. The minister, however, said the aforementioned claims does not imply that the former vice president will be arrested on his return.